No we don’t have some kind of weird fetish but Costa Rican restrooms have enough unique attributes that it’s worth a word or two of warning for first time visitors. There’s a universal standard in plumbing that the hot water is on the left…except in Costa Rica. Which knob in the shower controls the hot water is generally random and the little H or red dot is usually meaningless as well. Also remember that in Spanish “C” is for “Caliente”. Cold water only sinks are common (even where the showers are hot) but most fixtures have two taps anyway. That means when you turn the hot tap you may get cold water or nothing at all depending on how it’s plumbed. Suicide showers are fading into history as they are replaced with safer under counter or through wall on demand systems or tank hot water heaters but you still find them in mid range and budget accommodations. Suicide showers are a cylindrical heating element encased in a marginally waterproof housing with an on/off or high/medium/low switch wired to 220 volts. They have enough amperage to light you up like a Christmas tree when the electrical tape works loose and you accidentally touch a live wire while standing in a puddle grounded through the floor drain. Suicide shower head. This is one of the better installations we’ve seen with a wood support and no bare wires hanging around. All I can say is be careful and you’ll probably live through the experience. I’ve survived hundreds of cool/lukewarm (the heaters aren’t very effective) showers with only one mild zap. Ventilator fans are not standard in bathrooms here. In fact they’re almost unheard of. There’s usually a window but some travelers may want to carry a small aerosol can of air freshener if they’re particularly self conscious or conscientious of other sensibilities. Even in modern luxury hotels, resorts and lodges I’d estimate that less than half the bathrooms have ventilator fans. Maybe it’s an incentive to try an ecotourism innovation common at luxury tent camps and other high end nature lodges – the outdoor bathroom. You never know so look before you go. Luckily for both of us I flipped on the light before using the toilet in the middle of the night. Outdoor bathrooms come in many shapes and sizes and in some of the remoter locations where complete privacy is provided by simply not having anyone else around the facilities can be completely open. 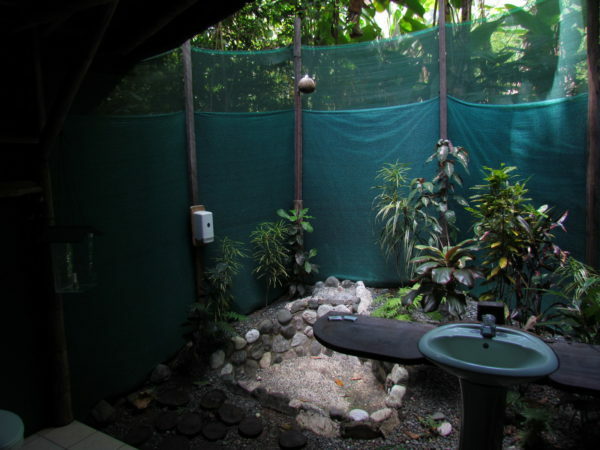 Others are more like screen rooms which reduce the likelihood of sharing the shower with an amphibian friend or getting a mosquito bite where the sun don’t shine. Some caution is required in an al fresco facility, especially at night. 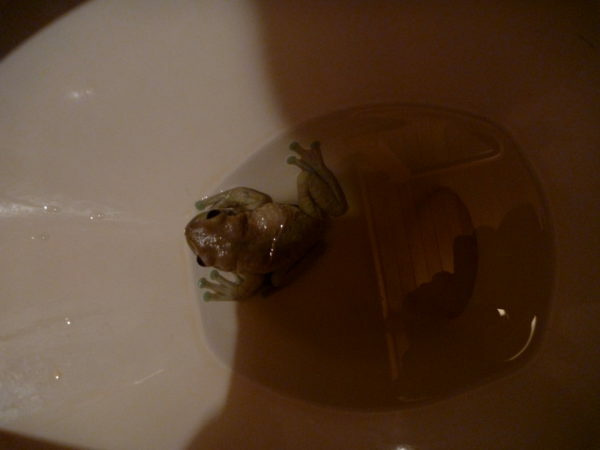 Not all of the neighbors are as cute as the little tree frog in the soap dish below. In August we were at Playa Nicuesa Rainforest Lodge in the heart of Piedras Blancas National Park on the Golfo Dulce and a bat snatched a gnat out of the air a foot in front of Sue’s face while she showered. One of the naturalist guides was convinced her scream was made by the Puma that had been seen on the waterfall trail that morning. 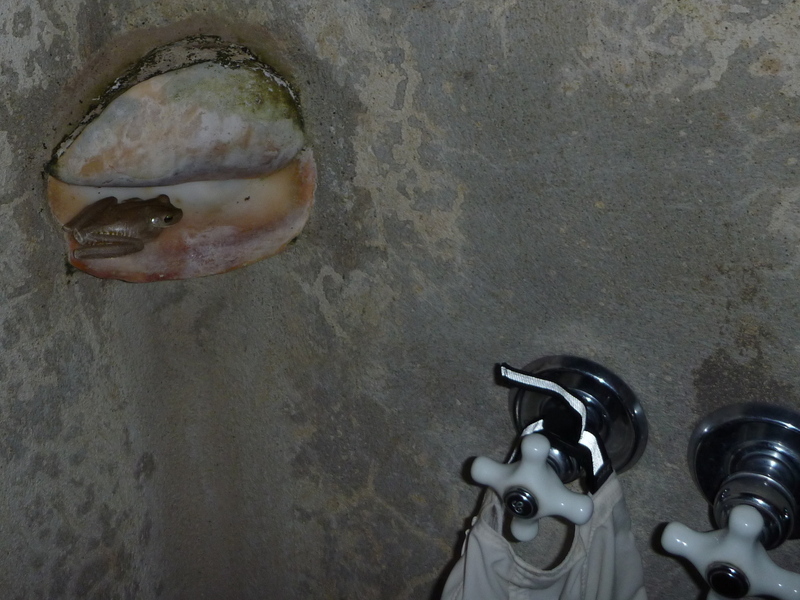 We came back to our room at La Cusinga near Uvita one evening to discover no less than three frogs in the outdoor bathroom. We thought we heard a fourth but could never locate it. Many bathrooms in Costa Rica lack a p-trap on at least one drain. As shown below a p-trap is a “P” shaped segment of pipe that forms a water seal between a drain and the septic or sewer system. If one is missing the smelly toxic gases to flow up and into your hotel room. Typically toilets have p-traps built right into the porcelain and sinks can easily be retrofit with a p-trap if one was not included in the original plumbing. The smelly toxic gas culprits are usually showers and floor drains. The drain plumbing gets covered over with cement during construction and if there was no p-trap installed the gas release is permanent. Vent pipes are usually built into the walls and hard to add later as well. 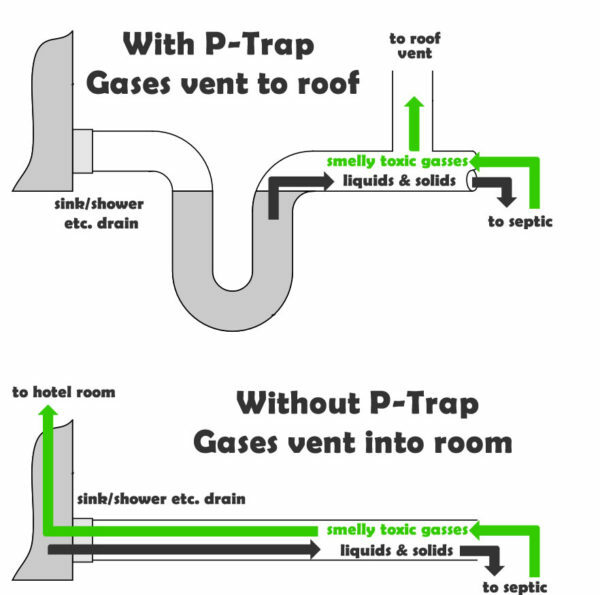 If you hear burbling and burping coming from the bathroom it’s probably because there is a p-trap but they didn’t vent it. The smelly toxic gases sometimes build enough pressure to bubble through the water seal in the p-trap. 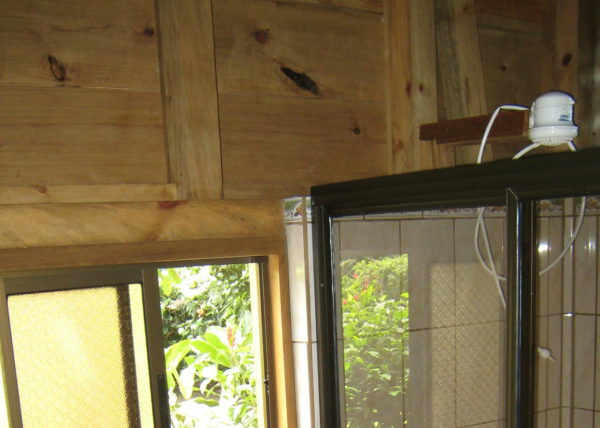 Most Costa Rican sewage goes into septic systems. Unfortunately the vast majority of these systems lack sufficient capacity and may be impossible to pump (or pumping services are not available) making them incapable of handling flushed toilet paper. That means after you wipe you deposit the paper in a trash can. Even the most modern bathrooms still usually have a wastebasket. We’ve been told that if there isn’t one then those conditioned by a lifetime of throwing the paper anywhere but in the toilet will deposit it on the floor. 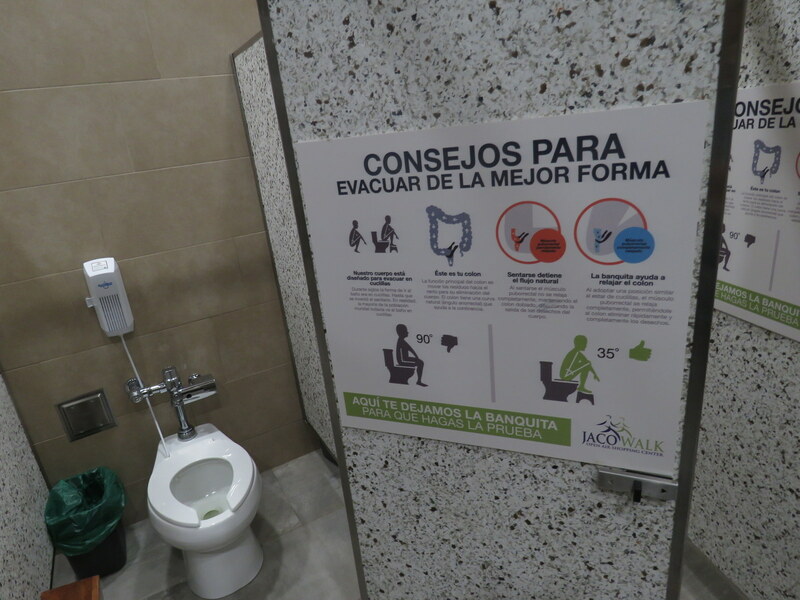 The public restrooms at the upscale new “Jaco Walk” luxury shopping and dining plaza come complete with instructions for using the latest 35 degree foot raising stool technology but still include an old fashioned poopy paper basket (I apologize for the awful but absolutely unavoidable pun… “stool” tech is really what it is called).